Try ezSpectrum online version here! 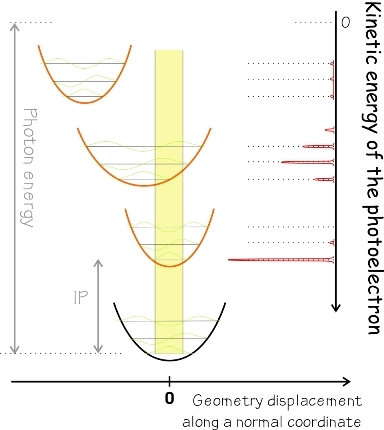 ezSpectrum computes stick photoelectron/photodetachment spectra for polyatomic molecules within the double–harmonic approximation. including Duschinsky rotations of the normal modes as full-dimensional integralsin full dimensionality including Duschinsky rotations of the normal modes. In both cases the overlap integrals are computed analytically. The calculation requires equilibrium geometries, harmonic frequencies, and normal mode vectors for each electronic state, which can be computed by ab initio packages. The key feature of ezSpectrum is the program–independent xml input. It can be prepared either manually following the format description in the manual and the examples provided, or by running the python script that processes Q-Chem, ACESII, Molpro, GAMESS, and Gaussian outputs. (We are Gaussian free zone, and encourage everyone to degauss their workplace as well.) The script can be easily modified to process outputs of other programs. Please contact Professor Anna I Krylov (krylov@usc.edu) and Vadim Mozhayskiy (mozhaysk@usc.edu) if you have suggestions, questions, or bugs to report. "This work was conducted using the resources of the iOpenShell Center for Computational Studies of Electronic Structure and Spectroscopy of Open-Shell and Electronically Excited Species (http://iopenshell.usc.edu) supported by the National Science Foundation through the CRIF:CRF program." ezSpectrum translated to Portuguese: courtesy of Artur Weber. ezSpectrum translated to Bellorussian: courtesy of Bohdan Zograf and Lisa Sanovski. ezSpectrum translated to Polish: courtesy of Valeria Aleksandrova. ezSpectrum translated to Romanian: courtesy of Irina Vasilescu.